Ships from and sold by Leavenworth Consignment. Comment: Meets or exceeds Amazon guidelines for good condition. Cover may appear used and pages may show wear. May have highlighting/underlining in text. 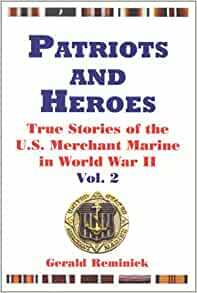 In response to many requests, the author has brought us Volume 2, more true stories (all new) of the perils and triumphs faced by the merchant marine as they crossed the world's oceans to "deliver the goods" during World War II. Volume one of this title is in its third printing. Gerald Reminick is a professor of Library Services at Suffold County Community College, Brentwood, New York. This is his fourth book on the merchant marine published by The Glencannon Press. Through oral history we know better the sacrifice of merchant mariners during war as they support the military operations as they see their fellow mariners sacrifice their lives unheralded and unappreciated as a whole.